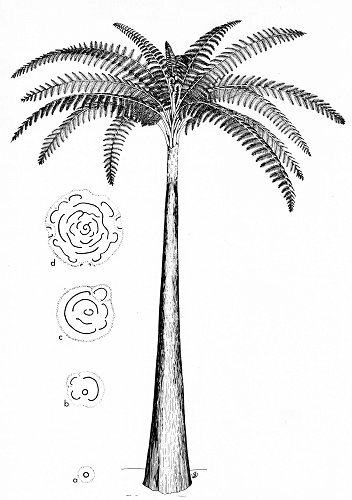 Psaronius is an extinct tree fern that lived during the Late Carboniferous and the Permian. It was most widespread during the youngest Carboniferous (Stephanian) and the Early Permian (Rotliegend). It could grow up to 10 or 15 meters high and wore a crown of Pecopteris leaves. The large number of Pecopteris fossils found in the Stephanian and the Lower Permian are an indication of the frequent occurrence of Psaronius. the tiny vascular strand of the young plant while growing upwards divides into several parts, causing an upward broadening of the wooden kernel. At the same time a large number of adventitious roots are given off, forming together a root mantle. This root mantle gives the trunk its required stability. The base of the trunk of the tree fern is often thickenend because of the broad root mantle. From the central strand of Psaronius also leaf bases split off. These were relatively thick because the leaves attained a length of 2 to 3 meters. The upper part of the stem didn't have a root mantle (yet) and below the leafy crown the scars of fallen-off leaves were visible. In lower parts of the stem these leaf scars were hidden by the root mantle. a, b, c and d are drawings of the wood kernel. Click the parts of the tree or at the slides. Part of a trunk from the upper part of a tree. With leaf scars. Transverse section in the upper part of a tree. Transverse section in the middle part of a tree. Transverse section in the base of a tree. 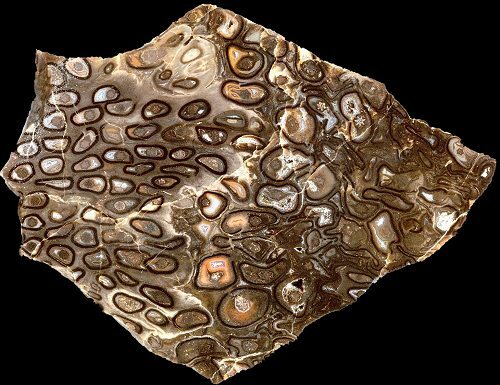 In the region of the city of Chemnitz (Sachsen, Germany) many silicified trunks of Psaronius (and other tree species) are found as a consequence of a gigantic volcanic eruption in the Early Permian, about 290 million years ago. Especially the silicified root mantles yield, after sawing and polishing, beautiful images because of the fact that the woody kernel of the rootlets is star-shaped. That's why these fossils are called Staarsteine, meaning star stones. The cellular structure outside the wood kernels has not been preserved in most cases and the room has been filled up with agate. Click the photo for more detail and for the star show. Research on coal balls from the US has revealed that the leaves of Psaronius are of the Pecopteris-type. Petioles with attached fronds have been found. Many of the leaflets still bear the sporangia. These are fused in a characteristic way to synangia. Pecopteris-leaves with such synangia are called Scolecopteris. At a couple of places in Sachsen, near Dresden and near Chemnitz, pieces of silicified rock are found containing Pecopteris/Scolecopteris leaflets. They are called 'Madensteine' because people thought them to be full of fossil maggots (Maden). The material of these Madensteine is called Hornstein or chert. Latest news! Tiny club-shaped objects with well preserved tissue have been found together with Scolecopteris /Psaronius. They resemble the mm-size first leaves of some extant fern and thus have been assumed to be very young plants of Psaronius emerging from a gametophyte. Early species of Psaronius are known from the Namurian of Scotland and the Lower Pennsylvanian of Illinois. In the Westfalian A and B this genus was still relatively rare but in the Westfalian C and D it became more widespread. In the Stephanian and the Early Permian Psaronius was most widely spread. The various species lived in very diverse environments: wet lowlands, peat forming wet woodland, but also on periodically dry grounds. Psaronius disappeared only later in the Permian, when the climate became very dry and hot in many places . Another interesting fact is that in and on the root mantle many epiphytic ferns were growing. Also liana-like ferns and seedferns were climbing up along the Psaronius trunks. Stems have been found with up to eight climbing axes of one plant. Often the rootlets of these epiphytes are found among the rootlets of Psaronius. They are strikingly different in structure from the Psaronius roots.